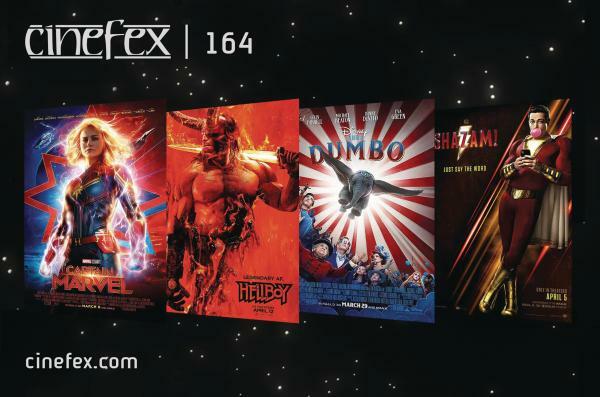 The magazine of the special effects industry looks at four upcoming films! In Captain Marvel, Marvel Studios and Walt Disney Studios wind back the clock to 1995, when a freak accident propels U.S. Air Force officer Carol Danvers into the ranks of an intergalactic Starforce. Director Neil Marshall takes the reins of Hellboy with this new outing for the comic book character created by writer/artist Mike Mignola. A remake of the 1941 animated feature, Tim Burton's Dumbo features some of the most evocative computer animation ever put to film. In Warner's SHAZAM! when teenage foster child Billy Batson utters a mysterious magic word he transforms into the adult superhero Shazam in this action comedy!